May | 2014 | Peace.Sweat.Love. Happy Memorial Day! 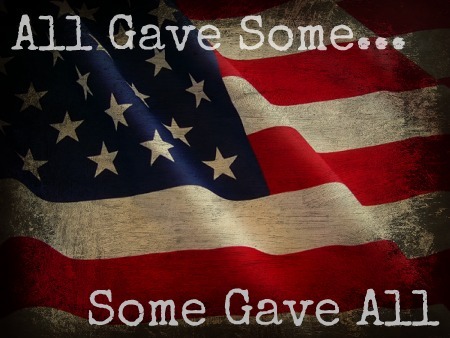 Go out there and enjoy those Memorial Day sales, but remember why we have this day, too. No matter what you think about the military and current/past military projects, remember that there are men and women who fought and died out of their love for their country. Like many of you, I did not simply experience one moment that changed my life. I didn’t suddenly come to my senses, so to speak, and turn my life around. In fact, it has been nothing but a series of slow movements forward, and a few obligatory steps backward, that have made up my journey. It was a journey that I actually never wanted to make in the beginning. A number of you (but certainly not all of you!) found your respective ways to fitness and balanced living because of weight gain. I actually came to fitness because of serious weight loss. I struggled with an eating disorder that ruled my life (and threatened to take my life) from middle school onward. Essentially I was baseline ill from the 7-8th grade until my junior year of high school when things became dangerous for me. I lost about a third of my body weight – which was alarming and staggeringly unhealthy for someone who was never “overweight” by any measurement. I hated myself and I took it out on my battered body. I was lucky enough to have an extremely involved and supportive set of friends and family to come to the rescue. These people quite literally saved my life. I also benefitted tremendously from medical intervention, both physical (nutritionist appointments, weigh-ins) and psychological (therapy appointments) in nature. The closest thing I have to an “aha!” moment that I can recall is moment during a therapy session when my therapist told me that former anorexics often end up being overweight. As a very sick and disbelieving teenager, I snorted at this comment at first, but then realized its significance. It’s because their bodies can no longer handle the starvation, she told me. They either kill themselves slowly or, when they finally begin eating normally again, cannot maintain a normal weight. However shallow it may be, this is what finally got through to me through my sickness. I realized that the choices my ED was making for me were in no way sustainable. I realized that my ED didn’t make me more beautiful or special, it made me sick and it encouraged me to ignore everything else that actually did make me beautiful and special. I realized that this was my life, and I had to, well, begin living it. Recovery was slow. Very, very slow. In fact, I’m not sure recovery ever stops. But I made it here, and today I can run and ride horses and do all the things that I was too weak to do when I was at my sickest. So, today I sweat. And I eat when I am hungry. Sometimes I even eat just because I want to. That is what my healthy looks like, and I am so, so grateful that I am here today to share it with all of you. 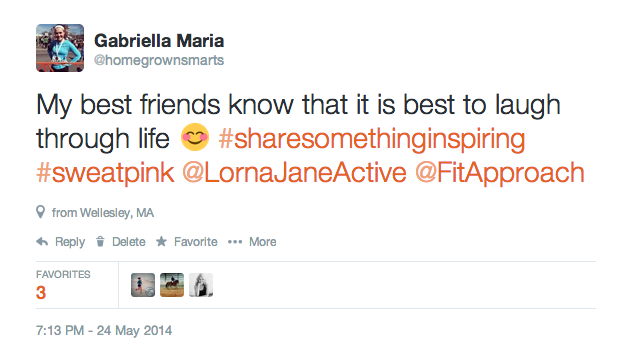 Twitter users out there – get involved in this awesome collaboration between Lorna Jane and Fit Approach and check out the #ShareSomethingInspiring hashtag! Not only is it an online effort to promote positivity and general feel-good vibes, but it is actually also a contest. The grand prize winner will receive a $500 gift card (!!!) 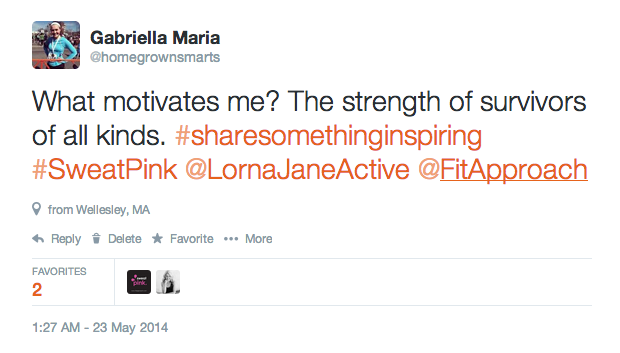 towards swaggy Lorna Jane activewear. 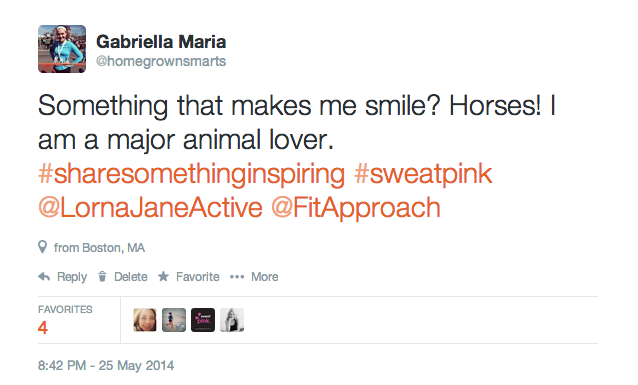 Just make sure to tag @lornajaneactive and @fitapproach in your tweets! 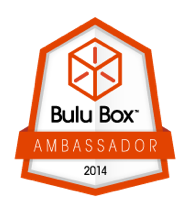 The contest will be running all month long, until June 21st. I figured the best way to share about my experience this week is just to share my Tweets themselves. 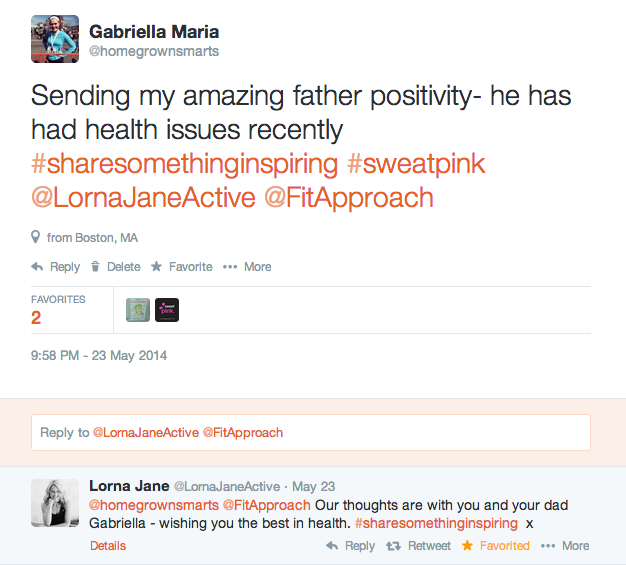 Shout-out to Lorna Jane herself for showing me lots of love, and even really sweetly tweeting at me when I mentioned my dad’s health! 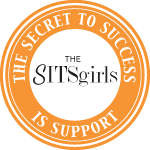 Join me and the rest of the #SweatPink set! Super excited to say that I am DONE with my finals and, by extension, my undergraduate career. Feeling a bit weird about that. It hasn’t sunk in that I’m graduating in a week – maybe because I don’t really want to think about it. It’s honestly just strange, and I can’t really feel anything about it right now. This is highlighted by the fact that I don’t know exactly where I’ll be come fall, so I’m kind of just generally anxious. BUT, per usual I need to get out of my own head and calm down. As you all know, I’ve already been accepted to BU Law as part of the class of 2017 , but here’s the wrinkle I maybe haven’t included: I’ve also been put on “reserve” at Cornell Law. I really, really want to go to Cornell. I will get an update by the end of this month regarding my status: accept, deny, or further wait-listed. Knowing that I will find out any day now is killing me. I’m scared every time I open my inbox (not to mention that I check it obsessively). I even had a dream about it last night. Ugh. But the other part of me knows that these worries come from a place of immense privilege, and that I need to stop and count my many blessings. I have to fight to remind myself to not play this game, because no one ever wins. How do I fight this? Well, my blog, in part! This blog is representative of that desire to free myself from the (often self-imposed) shackles of my perfectionism. Peace.Sweat.Love is a mantra of sorts – hey, it works for me! And so that’s why, to me, making a joint post about law school/future anxieties and a race recap makes sense. It’s not random – to me those things are connected. When I was running my 10k this past weekend and my Nike+ kept telling me my pace, I felt crushed that it wasn’t as fast as I wanted it to be. It was so distracting, in fact, that I almost forgot that my only job was to finish and to have fun. Why was I doing that, getting mad at myself for not running a PR? How on earth does that make sense? It’s moments like this when my old demons creep up and try to get in my head and erase everything I’ve taken so much time to (re)learn. Miles 2-4 I was in a terrible funk despite the fact that I was running this race with my loving S.O. and a dear mutual friend. Finally, mile 5 I started to get it. Or adrenaline kicked in, or I was just less grumpy because it wasn’t as hilly. We crossed the finish line together, and I had to remind myself that that was what I came for. By focusing too much on the end result, I ultimately forgot to stay present and cost myself some of the joy I could’ve gotten out of the experience. 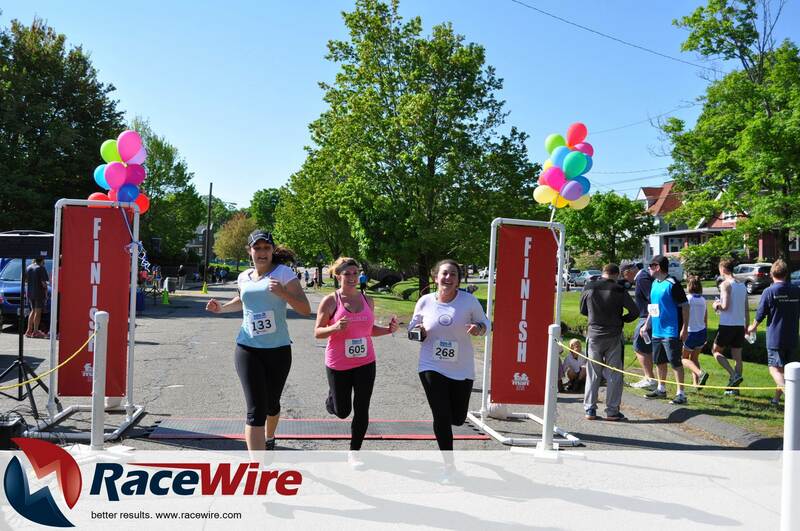 Yeah, I definitely didn’t get a PR during this 10k like I did with my last 5k. But I think this forced me to address some important and consistent underlying fears I have. And like a lot of other people who find exercise to be a healing influence in their lives, sometimes I just have to physically tire myself out before my stubborn mind is willing to tackle my fears. 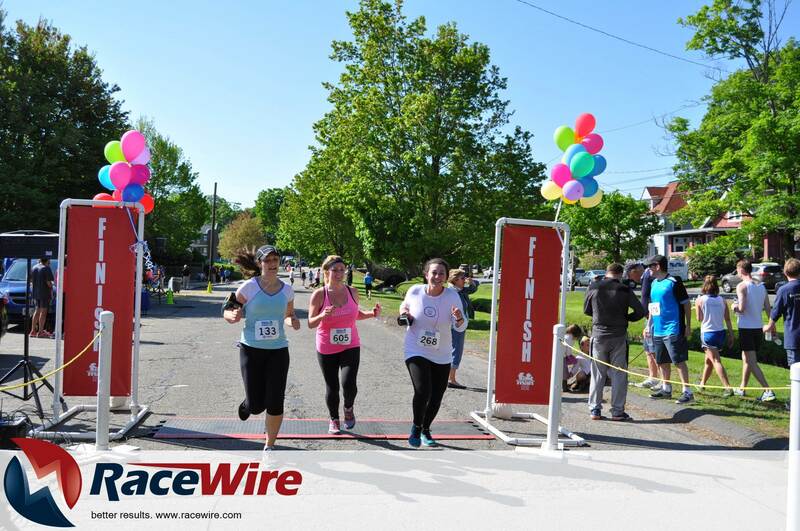 PS: Check the “Races I’ve Run” page in a bit for a more detailed run-down of my experience at the Newton 10k! Friends, I have to make a serious post. I’m not sure if any of you have been following the recent happenings at Amherst regarding sexual assault and the recent ban on fraternities. If you haven’t, I suggest reading up on it quickly. Please note that it contains heavy subject matter and is also extremely touching. Tears may follow. But whatever you do or do not read, please read this. It is a highly emotional and unimaginably brave piece by someone I am honored to call a friend. The discussions taking place surrounding Amherst, fraternities, and sexual assaults are understandably fraught. As someone whose job has been conducting research on sexual violence in schools, I know that all too well. I am committed to ending sexual violence in all forms, but I do not think a ban on Amherst fraternities in any way constitutes a serious commitment on the part of the administration to supporting survivors. I am of the belief that more comprehensive grassroots efforts must be made to change a culture that thrives virtually everywhere, not simply within the confines of the fraternity. What’s the Healthiest Diet in the World? Though there is no one scientific conclusion, it seems that (unsurprisingly) the answer is: a diet based on moderation and inclusion rather than on exclusion. “Other evidence that there are many “healthiest” diets comes from the real world. In my work as a sports nutritionist, I have analyzed the diets of large numbers of world-class endurance athletes. This is an extremely healthy population. Without a doubt, most elite cyclists, runners, swimmers and triathletes would come out very near the top of general health rankings based on a battery of tests like the ones described above. Very few of these men and women are members of what I call “diet cults” (e.g. the Paleo Diet), which are based on the premise that there is only one correct way for all humans to eat. As someone who has struggled with disordered eating and who has failed to properly nourish her body at various points in her life (something that I think is, sadly, becoming the norm for many women regardless of whether they have ever had EDs), this is crucial to me. Recognizing that my diet could and should just be a balanced, happy and healthy relationship with food was groundbreaking. I am a total health nut, true, but I am never one to turn down a cupcake when I am offered. Paleo nuts can do whatever they want, but I am going to keep eating the way my Mediterranean ancestors have been for years. Plenty of fruit and veg, healthy fats from nuts and olive oil, lots of carbs for fuel, and lean proteins. Hey, it works for me (and it’s delicious)!